MOSCOW, December 30. /TASS/. The Board of Directors of Gazprom has approved a 310 million euros loan to South Stream Transport B.V. to finance the construction of the Turkish Stream gas pipeline, Gazprom said in a statement. The loan will be granted for 3.5 years. 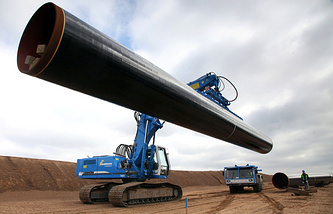 "South Stream Transport BV will use the funds granted by Gazprom to finance the costs on the Turkish Stream project, including payments under the contracts for the supply of tubular products and equipment, storage and performance of construction work, contracts for the purchase of goods, works and services, as well as general administrative expenses," according to the statement. The Russian authorities announced the Turkish Stream in December 2014 to replace the South Stream gas pipeline project. It was planned that the offshore section of the Turkish Stream gas pipeline would comprise four stretches with a capacity of 15.75 bln cubic meters each. However, the negotiations on the project were subsequently suspended, including due to the crisis in bilateral relations. After talks held between Turkish President Tayyip Erdogan and Russian leader Vladimir Putin in St. Petersburg in August 2016, a decision was made to resume works under the Turkish Stream gas pipeline project, set up a working group and prepare a roadmap. The Turkish Stream project envisages the construction of a gas pipeline across the Black Sea to the European part of Turkey and farther to the border with Greece. The pipeline’s offshore section is expected to equal about 910 km and its overland segment on the Turkish territory 180 km. The project is estimated at 11.4 bln euro. Gas deliveries via the first stretch of the gas pipeline are designed wholly to meet the requirements of the growing Turkish market.